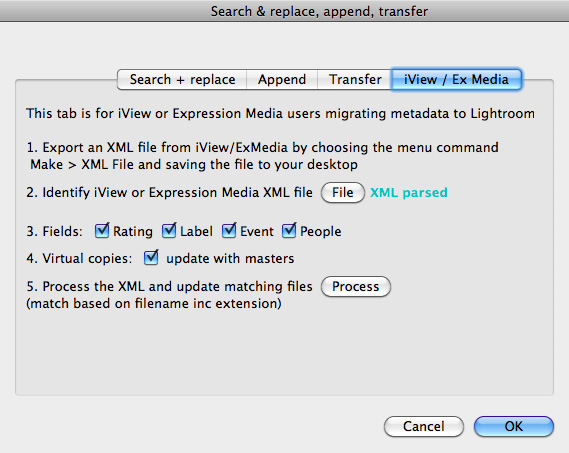 Most iView / Expression Media metadata - keywords, title, caption, rating etc - can be transferred to Lightroom by using the iView / Expression Media “Sync” command which writes the data into the original. In Lightroom’s Library, you then use Metadata > Read Metadata to bring the information into your catalogue. However, iView / Expression Media has extra fields for Event and People and up to 16 custom fields. These don’t have a matching place in Lightroom. And while iView / Expression Media star ratings are common with Lightroom, coloured labels are recorded differently. Run Make > XML Data File which creates an XML export containing the metadata for all the thumbnails currently visible. Save this file somewhere you can easily find it - eg the computer’s desktop. Close iView / Expression Media and go over to Lightroom. Select the files you want to update and run Search Replace Transfer. Identify the XML export file and wait until it has been parsed - you'll see "XML Parsed"
The plug-in uses the filename and extension to match files in Lightroom to the XML data. If your filenaming convention is loose and allows for filenames to be duplicated, then you’ll need to take special care - eg work on one folder at a time. And it never hurts to take an extra backup of your catalogue or to test the procedure before trying it for real.